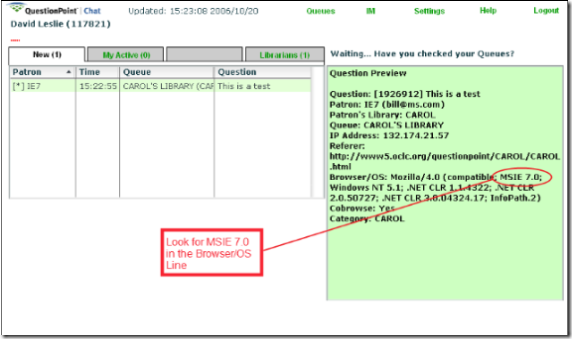 How can I tell if a Patron has IE 7? Please note that while Co-Browse shows as YES we are still testing this functionality with the released version of IE 7. Microsoft has just released the consumer version of Internet Explorer 7 (IE7). We have been testing QuestionPoint with the previous beta and release candidates of IE 7 and have made some changes to QuestionPoint in anticipation of the release. We continue to test with the just released consumer version and we will be posting updates to our testing efforts to the blog weekly. We are not yet certifying IE 7 as fully compatible with QuestionPoint at this time. If you have the option, please do not install IE 7 until we have completed our testing. 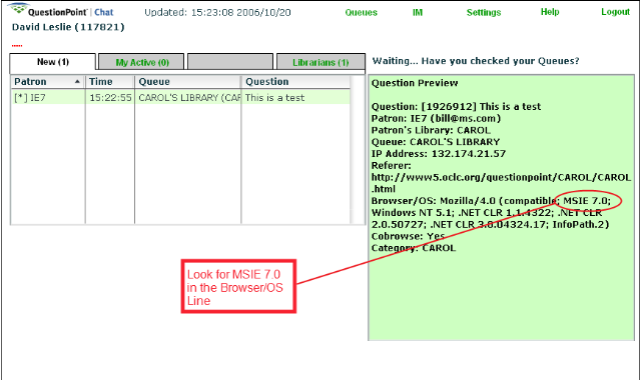 If your IT department requires you to use IE 7, or if it has automatically downloaded due to your computer setup, please report any issues that you encounter with QuestionPoint using our Chat Tool Migration Feedback form (https://www3.oclc.org/app/questionpoint/migration/). Please be sure to note that this is an IE7 issue in the form. This feedback will assist us in hastening completion of our testing process. On Sunday morning, October 8, at approximately 3:00 a.m. ET, a number of bug fixes and a few enhancements will be installed for QuestionPoint. The system will be unavailable for about 15 minutes. 1. Retrieve a list of 24/7 Cooperative members. Available from the My QuestionPoint home page reports, these lists are updated each time a new institution or group joins the cooperative. There is a separate list for Public and Academic. Click on Reports and select the Participants tab. These lists are for QuestionPoint subscribers only. Please do not distribute them publicly. 2. Add or change patron's e-mail address. When a patron has begun a chat session anonymously but then consents to follow up by e-mail, giving their address in the transcript text, you can now easily add the address to the transcript's e-mail address field. This new functionality will also serve well for those times when you can see the patron has made a simple typographical error in their address, causing nondelivery of any answer or follow-up messages. A new button appears on the Full Question view in the Ask module. 3. Select queues from inside the Flash chat monitor. A new window is no longer opened when you click on the Launch Chat link. Instead, the chat monitor opens, with a queue-selector pane open within it. A message reminds you that you must select queues before beginning. Should you somehow navigate off the queue selector pane, a message reminds you "Have you checked your queues?" 4. Receive a modified message in Flash chat. When another librarian has picked up a session before you or when the patron has closed the window before you have a chance to pick up, the message you receive is modified. It now reads: "Important: Either another librarian selected this "New" chat patron first and is currently answering, or the patron has chosen to end the session. Please select another patron." 5. See larger menu windows to better select the scripts. While uising the Flash-based chat and co-browse, a larger window area allows you to see more script titles to choose from. Additionally, you'll see that both institution and group-level URLs can now be selected in the chat monitor. 6. Block delivery of account information to patron. If you do not wish your patrons to use the QuestionPoint account that is automatically set up for them when they first contact you, administrators can block the account information from being sent in e-mails. This is one of the Custom Messages options in the Administration module, Institution tab, Settings link. 7. Identify French geographical areas more precisely. 8. View in a new language, Catalan. All documentation and training materials will be updated to reflect these enhancements.